Open ICQ and from Preferences go to the connections section. 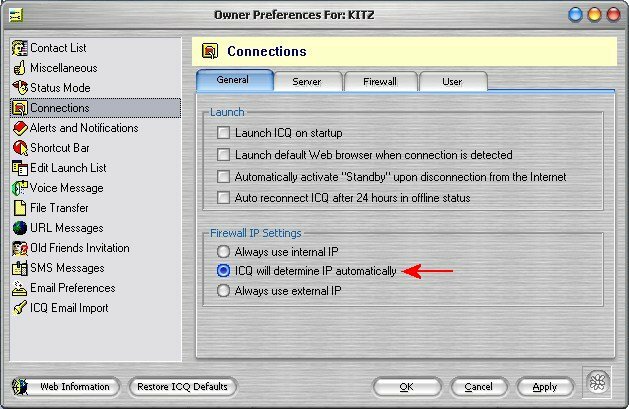 Under the general tab click the "ICQ will determine IP automatically". Under the Server tab, set "Using Firewall" and "Not using a proxy". Settings for the Firewall tab can be left as default. Under the User tab Set "Not using Proxy" and "Use the following TCP listen port". Put in the numbers From 20000 to 20019 for the first PC on the network. Subsequent PC's will have 20020 to 20039 etc. Then set up your router with the relevant port forwarding rules.